Blessed Pentecost! God the Holy Ghost is everywhere in the Church, in the Church year, the Mass and Sacraments in our soul, in our life. But once a year comes the great feast of the Descent of the Holy Ghost on the Fiftieth Day, which enables us to recognize, to remember Our Lord’s own Spirit, and to rejoice in His presence among us. He is the Sanctifier, who prepares and blesses and consecrates our offering. How fitting, then, to keep His feast as we do each year, offering to Him especially our “first fruits,” the innocent little ones who will soon receive the Son of God in Holy Communion. 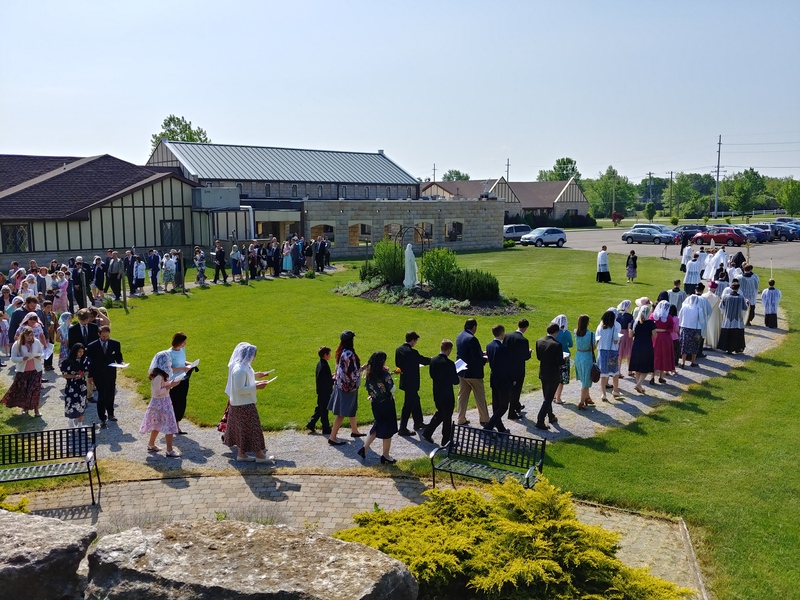 Joining them yesterday were a good number of older candidates whose youth was restored at the altar of God by this “Sacrament of Christian maturity.” Congratulations to our twenty-seven new Soldiers of Christ. But this is the Season of Sacraments. 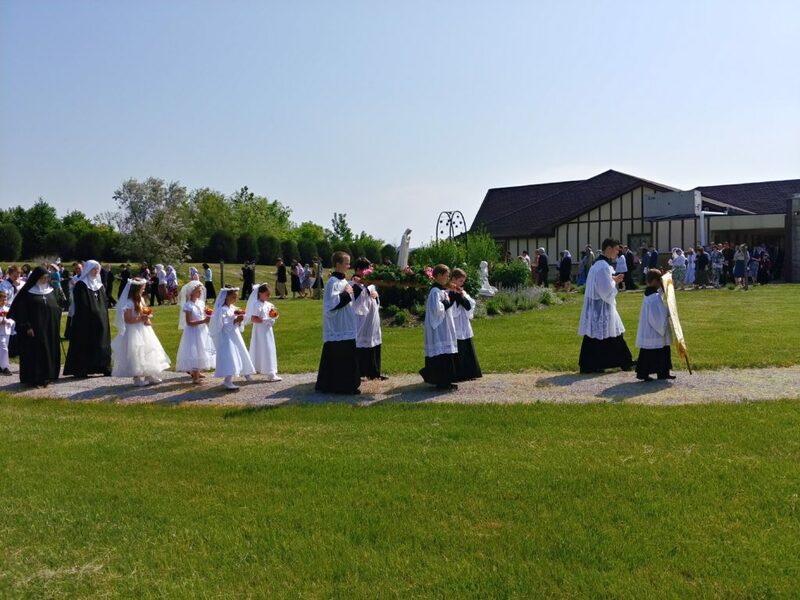 In addition to Confirmations, First Confession and First Communions, I’m happy to announce Holy Orders, which makes the Mass and the Sacraments available to the faithful. Bishop Sanborn will ordain a French seminarian, Abbé Damian Dutertre, to the Holy Priesthood this Saturday at a sem-inary chapel near Turin, Italy. Bishop Selway and some seminarians will also be in attendance. Please keep this fervent young Levite in your prayers this week, as well as our newly confirmed. God the Holy Ghost it is who gives the growth, and watches over the maturity of the fruit. Let us thank Him for this season of graces. Please remember in your prayers Bishop Frank Slupski, who was buried near Chicago this past Thursday. Bishop Slupski was ordained a Redemptorist priest in Poland in 1962, and came over to this country after the changes. For years he traveled a grueling circuit to serve mostly private chapels and little groups in the Midwest. I knew him as a humble, hardworking, quiet and meek priest. Unfortunately in later years he got himself consecrated a bishop, and as some of these holy but supremely imprudent men did, caused great damage to the Church. God will judge. Let us commend his soul in grateful prayer, mindful of how many souls he once served so faithfully, and with so much sacrifice. Requiescat in pace. Bishop Sanborn’s Australian mission has run into a spot of trouble with the Immigration authorities. Young Fr. Eldracher returns stateside this week until things get sorted out, with Fr. Palma replacing him for ninety days on a tourist visa. Please pray for a good solution. But Fr. Eldracher must leave on the very feast of Our Lady Help of Christians, May 24, Australia’s patroness. Surely this is a good sign. On that same day an Argentinean priest who had been assisting Fr. Ercoli in Seattle, Fr. Romero, must also leave for the same reason. “Don’t governments have anything better to do than deport dedicated priests?” you might ask. “Indeed,” as the Australians might say. But governments have a long history of going after good priests. So we pray for some relief. Our Lady Help of Christians is also venerated in Argentina, due to the influence of the Salesian Fathers. I’m sure she’s watching over her priests. The government is also making it increasingly burdensome, complicated and time consuming for Fr. Cekada to send money to Fr. Nkamuke in Nigeria, or to priests in foreign lands in general. I recall reading once that the Nazis used to tie the priests up with form after form to be filled out and filed, a weight of bureaucratic rules and regulations. Where’s the AntiFa when you need it? Our Lady Help of Christians, help us! Her statue adorns the Blessed Mother altar. But isn’t the May altar beautiful and stately this year? Our Lady’s crown reminds one of La Salette, or the crown of the Vietnamese Madonna. It was only one week ago that we crowned Our Lady of Fatima with flowers on Mother’s Day, after a simply beautiful May procession. I needn’t have worried for the evening Fatima Rosary Procession. Our Lady sent cool breezes to refresh the 35 some souls who publicly prayed her Rosary for peace. Oh, there were the Lesser Litanies last week, too. Much marching, much praying. These are some of the holiest days of the year. Pentecost continues all week, but Monday and Tuesday are great days still, Feasts of Devotion. Remember your Ember Day fast and abstinence, and pray for those who must make their Easter Duty yet. It was a pleasure spending Thursday’s Day of Recollection with our young people as we prepared for Confirmation. I thank the Sisters for their assistance. I was happy to see so many Michiganders who came to Joseph and Jacinta Young’s wedding last week, and stayed for Sunday. It was good to visit with them. There are some differences among our groups, of course, but these occasions remind us that we are all Catholic. May the Holy Ghost bring those who stray in error’s way back from the jaws of the new religion, and save us all from growing too cultish in our isolation. I saw a Monarch butterfly the other day, right where the Butterfly Bush used to be. I wonder if they remember? A killdeer showed up recently, and perched on a shrine as if he owned the place, but robins still rule the roost around here. Fr. Cekada gave me some tuna seconds for the cats, and they’re loving it. Maybe they’ve had enough bunny for awhile. May your every breath be a prayer to the Holy Ghost, the Breath of God! This entry was posted on Saturday, May 19th, 2018 at 4:38 pm	and is filed under Announcements.